Windows 8 comes with Internet Explore 10 as the default web browser and a Bing tile prominently displayed on the Start screen. Google Wants to change that. With Windows 8 officially hitting the shelves this past Friday, Microsoft will regain some significant ground on the ongoing search/browser battle. And they are doing it through a tried and true method: by default. 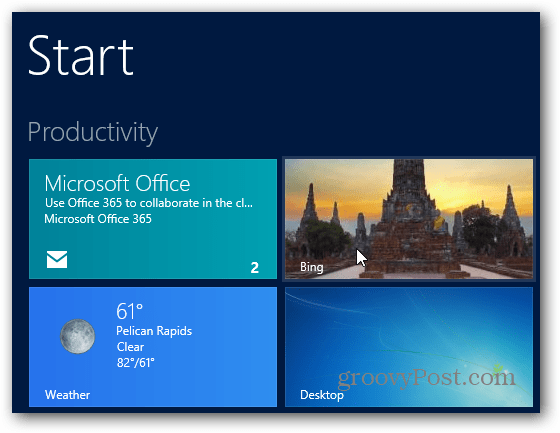 When Windows 8 users first install the latest Microsoft operating system, the environment will be pre-loaded with Internet Explorer 10 and Bing tiles prominently ensconced on the Start screen. The Bing tile on the Start screen is particularly inviting, providing a virtual window to Bing’s signature breathtaking picture of the day. And Internet Explorer, of course, is the default browser for all web pages found through the search. Google’s answer to that usage share grab? On the same day that Windows 8 was released to the public, the search giant posted an invitation on the official Google Blog for all Windows 8 users to “Get Your Google Back.” The process for doing so is easy as pie, thanks to a simple guided tutorial found at GetYourGoogleBack.com, but Google’s accompanying video is still worth a watch, even if only for the groovy tunes. 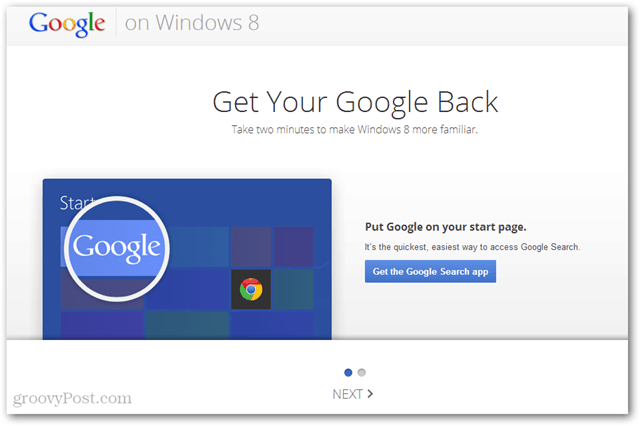 Step 1 of the Get Your Google Back site is to visit the Windows Store to grab the official Google Search app. The Google Search app for Windows 8 adapts to the touch-friendly “Metro” environment, with features built for swiping, such as the image search and image preview. The Start screen tile for the Google Search app strives be equally as eye-catching as Bing’s by displaying the Google doodle of the day (doodles, in case you haven’t been to the Google homepage in the past few years, are playful riffs on the Google logo, which are typically commemorative, tongue-in-cheek or both). After completing the above two steps, the Windows Start screen will prominently feature a Google logo in the upper-left and a Chrome tile just beneath it. And somewhere, in some distant data center, an analytics bot starts ticking up points for Team Google. The Get Your Google Back campaign comes off as lighthearted and unassuming, which is fitting for the company that still bears “Don’t be evil” as its unofficial motto. But don’t be mistaken: this is serious business. Google is making a calculated foray into Windows 8 territory to bird-dog longtime users getting their first taste of Microsoft’s new and improved search and web browser products. And by playing the fun-loving old buddy, rather than the overbearing jealous ex-boyfriend, the counterattack just might pay off. Upon first installation, Microsoft will have a monopoly on search and web browsing products. You can’t even download Chrome without using Internet Explorer 10 for at least a little while. This presents a golden opportunity, since, quite frankly, Internet Explorer and Bing are better than ever. Making things worse for Google, Internet Explorer 10 is somewhat notorious for making it difficult to switch the default search provider (here’s how to do that, in case you were wondering). However, the Get Your Google Back effort might shorten that honeymoon, which is even more crucial this time around. Bundling proprietary software and services with the hopes of making them the de facto choice is far from a new tactic. But it’s one that Microsoft hasn’t been able to leverage since 2009, when Windows 7 was launched. Back then, Chrome was a mere sapling, fighting to gain a 2% market share by July 2009 in the shadows cast by Internet Explorer and Mozilla Firefox. On the search front, Microsoft’s recently launched Bing had climbed to an 8.9% market share, compared to Google’s 64.7% share in July 2009. Today, Chrome lords a 29.03% usage share over Internet Explorer’s 22.08% share. And with more users searching from more devices than ever before, Google and Bing are quickly becoming the era’s Coke and Pepsi. With enthusiasm strong for Windows 8 (including the new Windows RT-powered tablets), and Google gaining ever stronger footholds in the smartphone and tablet space (not to mention it’s still expanding cloud empire), it will be interesting to see how this recent skirmish at the launch of Windows 8 plays out. Google is done. Bing is going to gain some serious market share thanks to Windows 8. You know, I have been using Bing for the past month. I set it as it as default search for Chrome Omnibar, and honestly, unless I really need something Google provides easily, I have no problem with it.